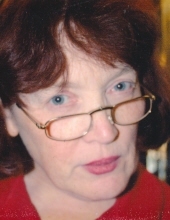 Mary Catherine Welch, age 68 and a resident of Dearborn Heights, died at home on November 5, 2018. Mary was the beloved daughter of the late Charles and Anna Welch. She is survived by her three sisters, Eileen (Jerry) Riley; Christina Hesburn; and Nora (David) Thomas. Mary is also survived by her long time friend, Danny Plachta, several nieces, nephews, and extended family members. She was preceded in death by her brothers, Michael, Patrick, William, Charles, Jr. and Brian. Mary worked for more than 30 years for JR Tobacco where she had many dear friends and colleagues. A Memorial Mass will be held at St. Mary Magdalen Church, 2201 S Old US-23; Brighton, Michigan on Friday, November 9, 2018 at 11 AM with gathering beginning at 10 AM. For further information phone Lynch & Sons, Brighton at 810-229-2905. "Email Address" would like to share the life celebration of Mary Catherine Welch. Click on the "link" to go to share a favorite memory or leave a condolence message for the family.